Today is a gift. 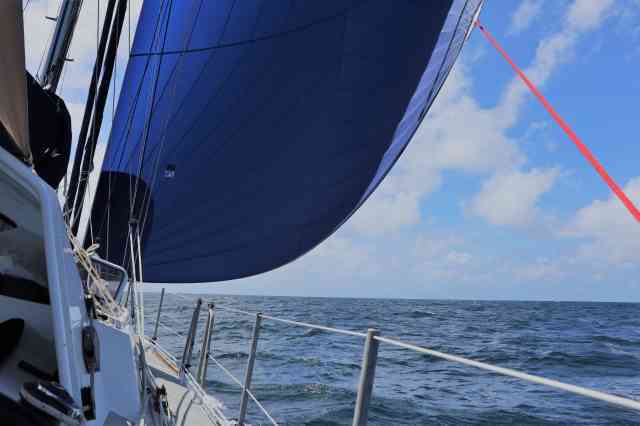 The waters are calm, the wind at 15 knots, 1 knot of current with, the sun is shining and we are flying our beautiful big blue gennaker and gliding with a whispering whoosh through the water at 6.5 knots. Sailing is perfect about 1% of the time and this is that 1%. And what more? At 0830 this morning we heard the lovely ziiiiing! of the fishing line and managed to land a beautiful bonito. Fresh tuna for lunch. A little lemon juice, garlic and pepper and lightly seared in a red hot pan with a little butter…nice and pink and soft inside. Yummie! We are now less that 100 nautical miles from the outside buoy marking the entrance to the Suriname River. The water have already begun to become shallow and instead of 5 kilometers under the keel we now have only 50 meters. The current is giving us a lift but also pushing us sidewards, our heading is 222 degrees while our course over ground is 254 degrees. Strange. We will have to slow our progress tonight and if all goes well we expect to arrive close to the buoy just before daylight. Almost there!